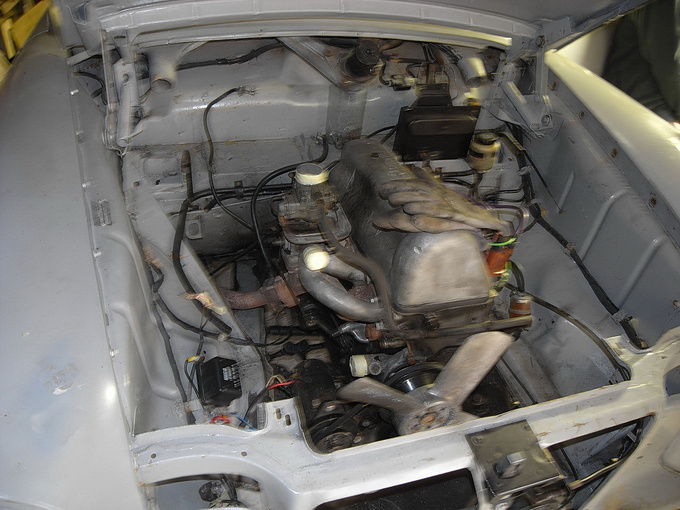 Totalcar Magazine - Classic and Beloved - You idiot, did you really believe it was rust free? 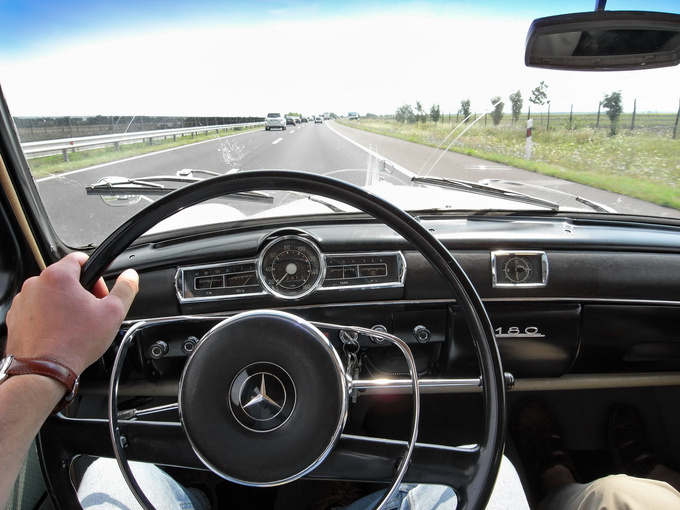 Getting the 1962 Mercedes-Benz 180c home was a horror but still, that was the easier part of the story. 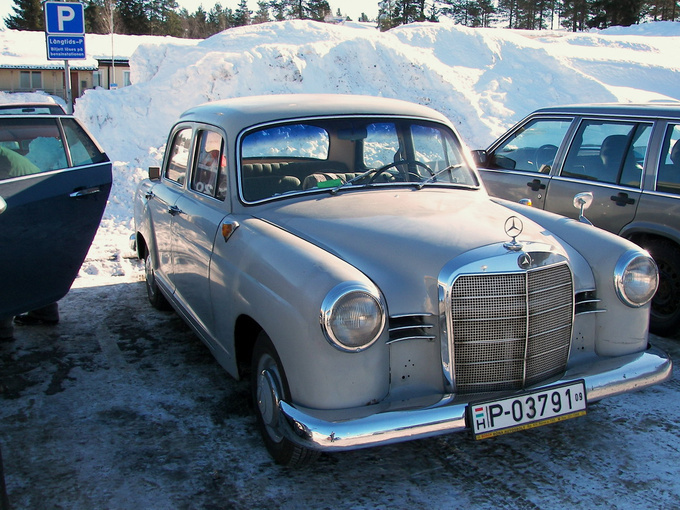 My half-century old Merc is finally at home, it (mostly) survived the 2700 km-trip from Sweden. Now comes the best part: restoration. No, please just don’t sneer yet! Luckily the problem didn't prove to be dramatic: the timing chain that some Swedish mechanic had put in the engine earlier was too long (it was the type for the 6-cylinder model). As it was slapping about, it gradually cut a hole in the oil pressure regulator valve's housing. That is the reason why the oil pressure meter started waving in alarm from Copenhagen all the way on the trip home; luckily I stopped the engine before real harm could have been done. 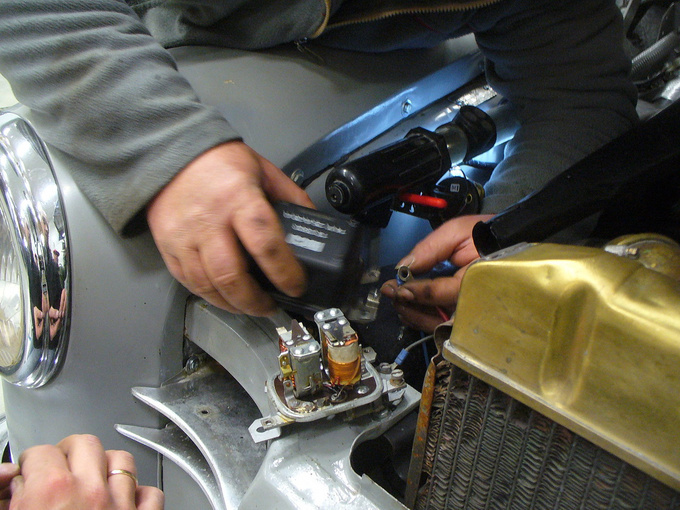 My good mate Karesz, who was with me all along and who has one of the shabbiest garages but probably the biggest knowledge in old Mercedes engines on Earth, solved the problem in no time. 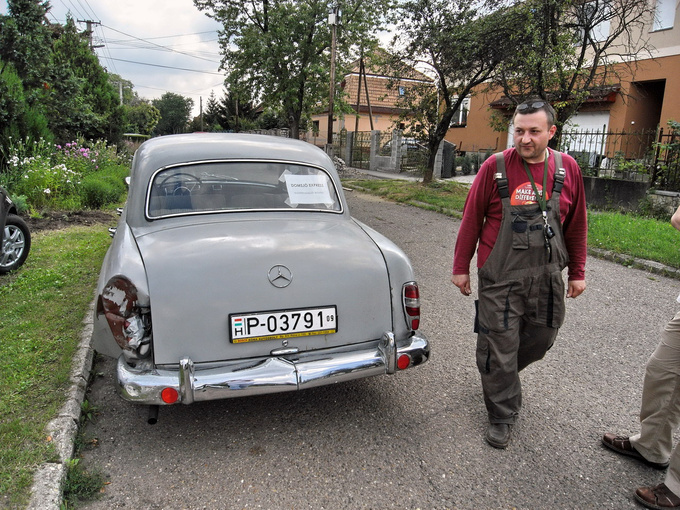 He produced a pressure valve from the engine of a later W115 Mercedes that was lurking around in the garden. (As a side note: it's really nice that in those times manufacturers tended to keep parts in production for tens of years. Had I tried to look for a W120 series-specific part it would have cost me lot of time and money. But this valve was the same in Mercedes petrol engines up to around 1982 helping the situation a lot.) He also found me a new-old-stock timing chain that had been lying around on a hidden shelf of a parts shop – for the third of the new retail price. He had the engine thoroughly washed internally and adjusted and within a day it was purring away. So, I picked it up and after two hours' travel the Ponton finally had a good night's sleep at the place that was to become its home in the garage under my house. 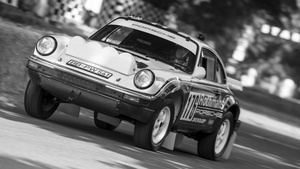 Originally I just planned a slight refurbishment of the car, like putting back the chrome strips on its doors, checking the brakes, suspension and the engine. Seeing the pictures of the car earlier on E-bay, I had hoped that its paint job could be saved with some massive polishing. But when I first got a glimpse of it in Sweden, I instantly knew that it would need a complete new paint job. And when the rear wing went mushroom-shape after the crash with the lorry, it also dawned on me that I wouldn't escape some major welding and fender-banging in the near future. 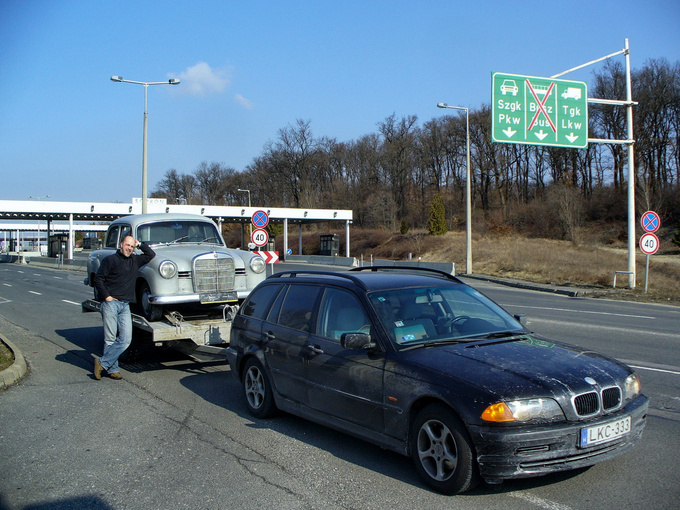 I wasn't too happy about being forced into this situation because I planned to have a nice, well-worn but usable old Merc to play with, not a refurbished one that you really have to shield from weather and the fellow but sometimes not so tolerant car drivers. I was a bit disheartened because the costs of restoration could easily amount to 1.5-2 times the money that I had originally calculated with. But fate decided otherwise, I had to accept the scheme. 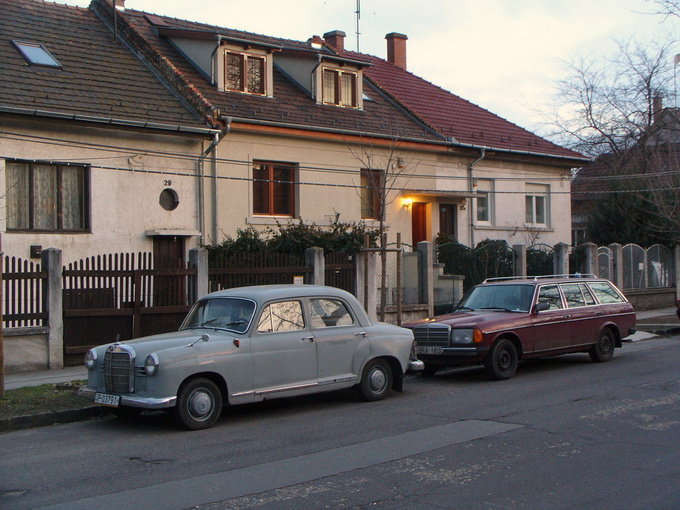 Solving international insurance cases couldn't be very quick anywhere in the world, but it's really a pain in the neck in bureaucracy-ridden Hungary. It took the best part of five months to get the money from the insurance company for the incident and until then I couldn't take the car to the welder's, because I couldn't be sure that the insurance firm wouldn't order a second inspection for it. What could I have shown them had I dismantled the car? Here's a bucket of rust as an evidence, yours truly? 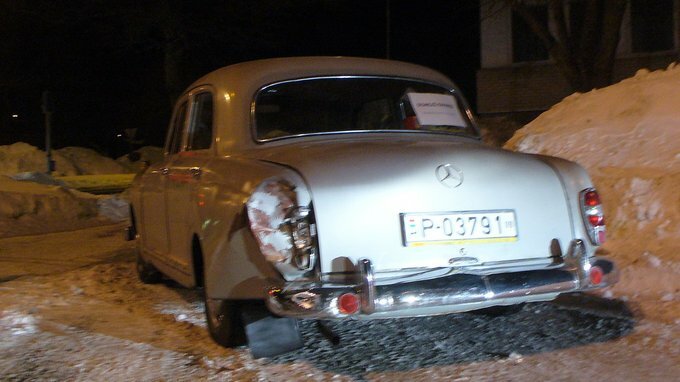 Because, at least in some places, that is what my Mercedes proved to be. A bucket of iron-oxide piled above the brim. In fact, the car turned out to be much worse than what was stated in the brief description that was given about it on E-bay. 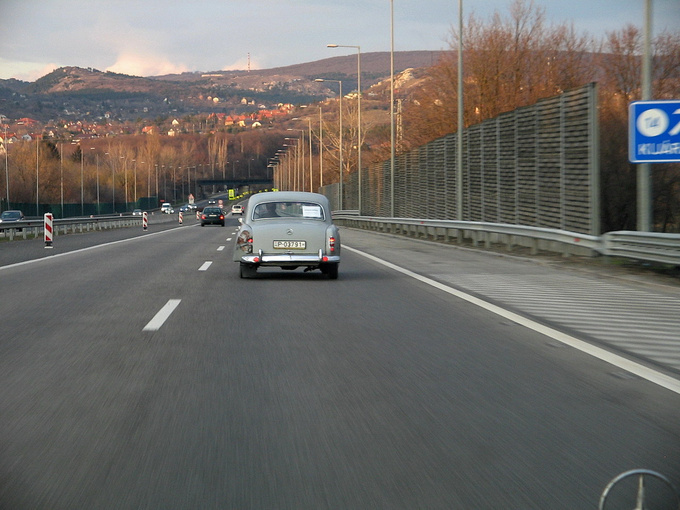 “No rust, nice interior, renewed brakes, good engine, bad paint” – these were the words that kept ringing in my ears. I hang on to them like a mountaineer to his rope in an avalanche on the Everest. True, the paint was really, really bad, even according to the more tolerant East-European standards. It was flaking, bubbling, great matte surfaces played hide and seek with some shinier patches on the panels, there were purple spots all over – just name a problem and it was all there. Not long before the body had been sprayed with thick stone chip protection underneath (a warning sign to all used car buyers), but without being able to dig deeper under the layers, there seemed to be no signs of rust anywhere. Amazing! The engine wasn't consuming oil either, and although petrol was dripping at the side of the carburetor and the motor's running at idle speeds was far from silky smooth, all in all it really was doing a fine job. The column-shift gear stick was quite sloppy but the synchros were okay, the diff didn't whine, the brakes pulled the car to a halt in a straight line (a surprising thing, as you'll understand later), and as we were doing 100-110 kph on the motorway, the whole car felt stable and in one piece. It was way better than what I expected from something that was made in 1962 and never restored. Of course two pieces of Bakelite trim in the interior were broken, the steering wheel had four huge cracks in it, the a huge wiper arm scratch blocked out much of the view through the windshield, the heating system didn't work, the pedals creaked as I pushed them, all the chrome was pitted (Mazak parts) or rusty (steel parts). The tyres weren't the correct size either, the driver's seat was incredibly dirty and its base was leaning to the left, the clock in the dashboard didn't work. But no matter how frightening they seem, these aren't serious issues with a car that has seen the better half of a century. I had high hopes for bringing it back to life properly. It really seemed to me that I had bought an ugly but technically very good car. How wrong my opinion proved to be. How very wrong! First stop in Eger. Nasty old Merc, why are you peeping so eagerly above the bush? 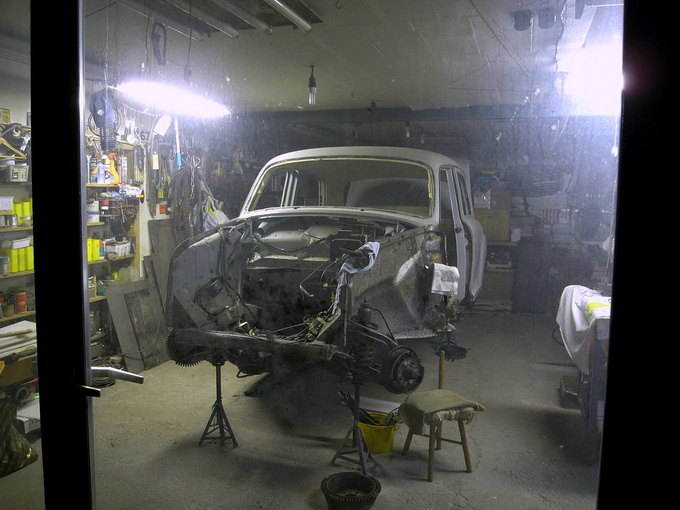 See, I have an incredible panel-magician friend in Northern Hungary, in the small town of Eger, who can really finish a car's body to concourse standards. I already have a car to prove it: a 1972 200 D Mercedes that he made earlier, but I've known many of his other projects too – they're all staggering. This friend, Csabi (Chubby) also has a mania for preservation, so when you get a car back from him it will have been zinced, waxed, greased, under- and overcoated to an extent that even a possible Third World War couldn't ruin it. Csabi was a natural choice to take the Ponton to. Two weeks after I dropped the Ponton at his porch the phone rang. In a true Csabi-style, he put up the question: “where should I start?” Fear crept into my voice as I answered, “anywhere”. He took the car apart, boy he did! And he found, well, how should I put it... things. The front suspension was in pieces, the kingpin was loose, all the six ball-joints were loose, some of them so badly that they nearly fell apart. The pins at the bases and at the ends of the front A-arms were shot. The coil springs were broken. The rubber in the engine mounts perished, the oil pipe leading to the manometer in the instrument panel was bodged together from three pieces. The speedometer's cable housing too, but that didn't work anyway. 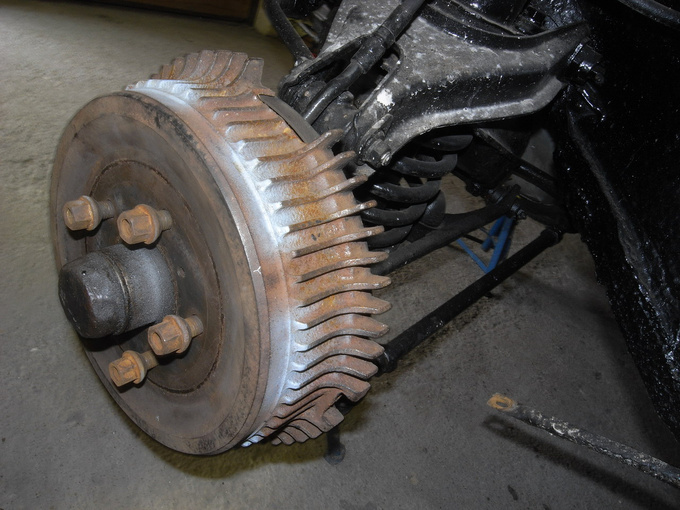 And there were the brakes. The lining was peeling from the front shoes. There are two brake cylinders on both sides at the front; all of them have two mounting ears each on one end. This is because the top end of the brake shoe fits between these ears. Well, one of the cylinders on the left side had just one ear left, the other must have been eaten up by history. On the right, the bottom cylinder was mounted at one end with some very un-standard (and un-automotive) screw – it almost fell off. The rear brakes weren't much better either, there oil was dripping in the left brake drum from the end of the swing axle (normally the diff oil is sloshing about in the axle housing, but when the sealing at the end lets go, sooner or later all the oil lands in the brake drum), so I had no stopping power whatsoever on that side. The gear linkage was worn and loose, it was missing all kinds of sophisticated washers and fasteners to keep it as a system. To make it work it was put together with cotter pins and washers from DIY stores. The whole contraption was so loose that somebody earlier had to hammer a dent in the firewall to give the linkage some more room for action. My Ponton truly proved to be a class E horror movie on wheels. And we haven't had a word on the body yet. 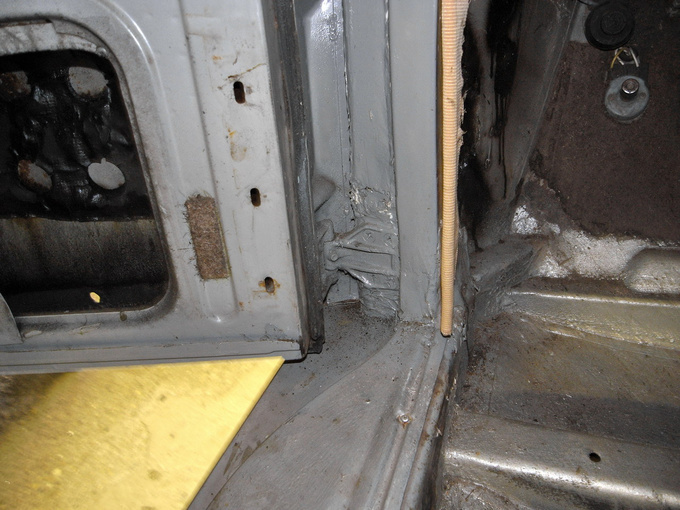 That area at the base of the A-pillar, on the driver's side that was suspicious from the first moment I saw the Ponton proved to be made of household piping sealant, some rust, lots of paint and a hearty blessing from the Pope. Under these disgusting layers Csabi found a further piece of sheet metal bent and glued there with the above mentioned sealant, so is looked like real metal. It had no mechanical role, its function was simply cosmetic. In fact, from the sill to the level of the windscreen surround there wasn't much car left here. Remember, this is the area of the body structure which is stressed the most – to the front there is the drive train, to the rear the rest of the body. 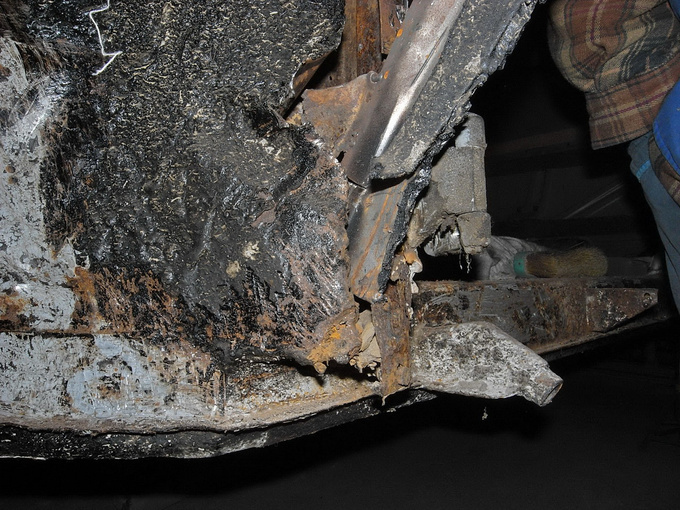 There should have been 3-4 layers of massive metal sheet holding everything together there instead of glue, sealant, underbody protection and rust. I had to make a decision. Carry on or sell? My childhood dreams kept hunting me. I knew that if I give up this Ponton, I will probably never have the chance of owning one again - the prices of these are on the up, this might have been my last moment to grab one. So instead of telling Csabi to put everything back together, I said to him: “Get along with it, buddy”. Everything is clear: now I just have to get a pair of stockings from my wife and a gun. There's always some money in the bank, you just have to get at it somehow.